Ludger Rémy and CPO caused quite a surprise when in 2003 they presented the St John Passion by Georg Gebel the Younger, a composer very few people had ever heard of. The surprise was even bigger when this work turned out to be of exceptional quality as I expressed in my review. Later that year another disc was released, with oratorios for Christmas and New Year, which generally confirmed that Gebel was a very good composer. Since then not much seems to have happened. 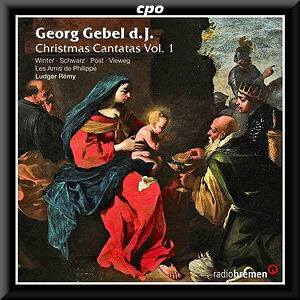 The commemoration of his birth in 2009 was a good reason to turn the attention to Gebel once again, and this has resulted in a recording and a public performance of two cantatas for the Christmas period. The addition of "Vol. 1" to the title indicates that more is to come. On the internet I saw that a second volume has already been released. I am looking forward to it, because this disc proves once again that Gebel is a really great composer. If you are looking for nice music which reflects the spirit of Christmas - probably even in a more or less 'romantic' way - then you will be disappointed. You won't find any melodies of Christmas hymns or carols here. Despite the picture at the cover these two cantatas hardly deal with the birth of Christ and the following events as described in the Gospels. They belong to the 62 extant cantatas from Gebels annual cantata cycle of 1747/48. Verfolge mich, o Welt is for the Second Day of Christmas, and was probably performed on Tuesday, 26 December 1747 - the English translation has erroneously September. This was also St Stephen's Day, the commemoration of the death of St Stephen, the first Christian martyr, as reported by the Acts of the Apostles (Ch 7). That is also the subject of the cantata. It is in two sections, to be performed before and after the sermon. It begins with a chorale setting which is followed by a chorus on verse 7 from Psalm 3: "I am not afraid of many hundred thousands who position themselves around against me". It is homophonic, introduced and closed by the strings. The tenor of this chorus is then extended in the next arias. The bass aria expresses the thought that "enemy and deceit are bound", whereas the tenor aria says: "Under my Jesus' protection I offer defiance to all foes". The chorale which closes the first part refers to the upcoming death of Stephen: "Farewell, O world, farewell, you my foes!". The emotional highlight of the cantata follows in the second part, when the alto - representing Stephen - asks: "Lord Jesus! Take up my spirit!" (Acts of the Apostles 7,58). A strong contrast follows in the defiant tenor aria: "No matter what! If people want to take my life, my spirit will not be upset". Then Stephen returns with a long aria: "Redeem my soul, Emanuel, from this pit of torment!". It is a piece of extraordinary depth, full of Seufzer, pizzicati in the low strings and rhetorical pauses. The hardship of Stephen's course of life is drastically expressed in slow and heavy steps in both vocal and instrumental parts. Remarkable is also the obbligato part for the oboe. The cantata has a link to Christmas after all: the mention of Emanuel refers to the prophesies of Isaiah who refers to the coming Christ as Emanuel. The second cantata, Gott Lob! mein Jesus macht mich rein, is for the Sunday after Christmas, and that was 31 December in 1747. It is not, as one may expect, devoted to the end of the year, but rather concentrates on the effect of Jesus' coming and in particular his suffering and death. The title summarizes the content: "Praise God! My Jesus makes me pure". The central thought is that thanks to Jesus' passion and death the faithful have been promoted from servants to children. The cantata, which is again in two sections, opens with a chorale, and then another verse from the Bible is quoted: "Christ has redeemed us from the curse of the law by becoming a curse for us" (Galatians 3,13). It is introduced by broad gestures in the strings. The second section is a fugue with harmonic progressions which are quite remarkable for Gebel's time, to put it mildly. The alto aria expresses the hardship of the people living before Christ's coming: they "had to spend their lives in toil". Remarkable is that Gebel closes the B-part with an accompanied recitative on the words "the mere word Cursed! did stand". In this aria Gebel makes again effective use of Seufzer and the word "mühsam" (toilsome) is followed by a general pause. The alto recitative refers to Christ as replacement of Moses, and the following aria states that "the guardianship is abolished". There is a strong contrast in tempo and rhythm between the A and the B part. The message of this cantata is emphasized in the second part in another quotation from the Bible: "But as many as received him, to them he gave power to become God's children, those who believed in his name" (John 1,12). An almost naive soprano aria expresses the joy of being "children come of age". The bass aria has a triumphant character: "What nobility to be God's child and heir!". The strings are joined here to good effect by two horns. The cantata closes with two stanzas of a chorale. It is true, as Manfred Fechner states in his liner-notes, that Gebel was in many ways a 'modern' composer who embraced the musical fashion of his time. But whereas some sacred music from the post-Bach generation tends to be a little superficial, Gebel's compositions are of remarkably expressive depth and sincerity. He is a master in the translation of a text into music, as the two cantatas on this disc prove. The alto aria from the first cantata I have mentioned is the most striking and the highlight of this whole disc. Britta Schwarz sings it with great sensitivity, bringing out all the emotion it contains. The other soloists also deliver fine performances. Veronika Winter catches the character of her only aria perfectly, and Matthias Vieweg deals well with the triumphant closing aria of the second cantata. Andreas Post makes a particularly good impression with his delivery, and gives an eloquent reading of the aria 'Immerhin! immerhin!' in the first cantata. Ludger Rémy has opted for a small vocal scoring. In the tutti the soloists are joined by the four members of Cantus Wettinianus Dresden, acting as ripienists. The instrumental ensemble is rather small as well, with six violins and three violas. The oboist Luise Haugk deserves special mention for her beautiful performance of her obbligato role. Rather then meeting the desire for discs with a typical 'Christmas spirit', this disc sheds light on how the Christmas period was celebrated in Lutheran Germany. It also underlines that Georg Gebel is a true master of his time.